I get asked a lot why I make things at home that I can just buy in the store. Usually my short answer is “it’s just better!” The reality is, there are several reasons, at least for me, that making something at home is simply my favorite option. For one thing, I always know what’s in my baked goods. 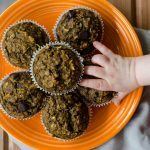 We try our very best at home to buy and eat things that have pronounceable ingredients and short ingredient lists at that. 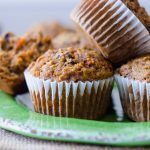 It’s hard to do that while (occasionally) indulging in sweets, so if I make it myself, I at least know exactly what’s in it. Secondly, I can control how much of it I want to make. A lot of times, you just want that one cookie or that one piece of cake or pie. 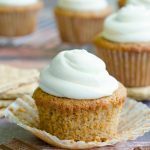 If you find yourself drooling over the snack aisle or bakery section, you’re likely to end up with more than you want, sometimes even multiple items you never went to the store to come home with in the first place! Lastly, have you ever opened a box of graham crackers and said “WOW! This is a GREAT graham cracker!!”? Likely not. Yes, I’m sure that’s happened with cookies or cakes or pies, but sometimes, things you don’t think can be more than just “good” end up being great once you’ve made them at home, because you can taste each and every ingredient without your taste buds getting distracted by chemicals. 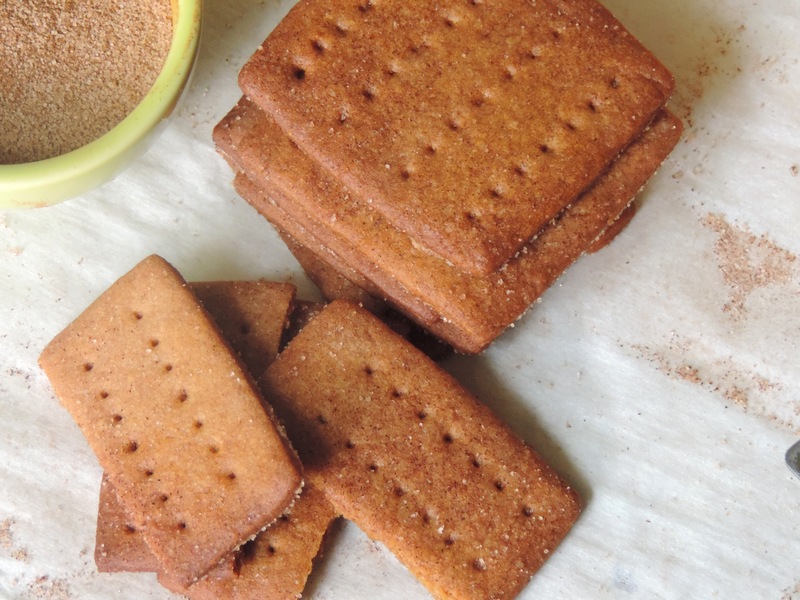 Enter: homemade graham cracker. This is one of the items I’ve had on my baking conquest list for a very long time. I always try to have a purpose for making something on my list, and I haven’t quite had the opportunity for these guys until now. A good friend of mine is having a housewarming party this weekend and of course, I volunteered for desserts! I have a few tricks up my sleeve for that, and these graham crackers will make their appearance in the form of a crust. And not to worry– all of those recipes will make it onto here for your summer treat enjoyment! 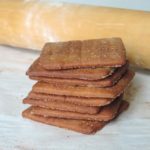 As listed, this recipe will give you quite a lot of crackers, so if you’re intimidated by making several dozen graham crackers, just start small. If you need some conversion help, just ask! 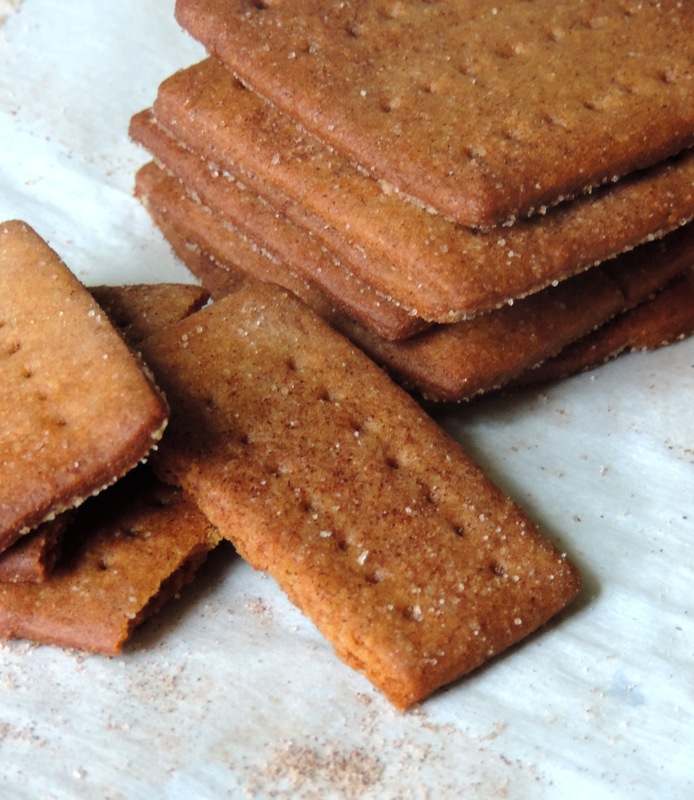 I did a little research on graham crackers before I attempted them because I wasn’t sure what exactly it is that gives them their “graham” taste. 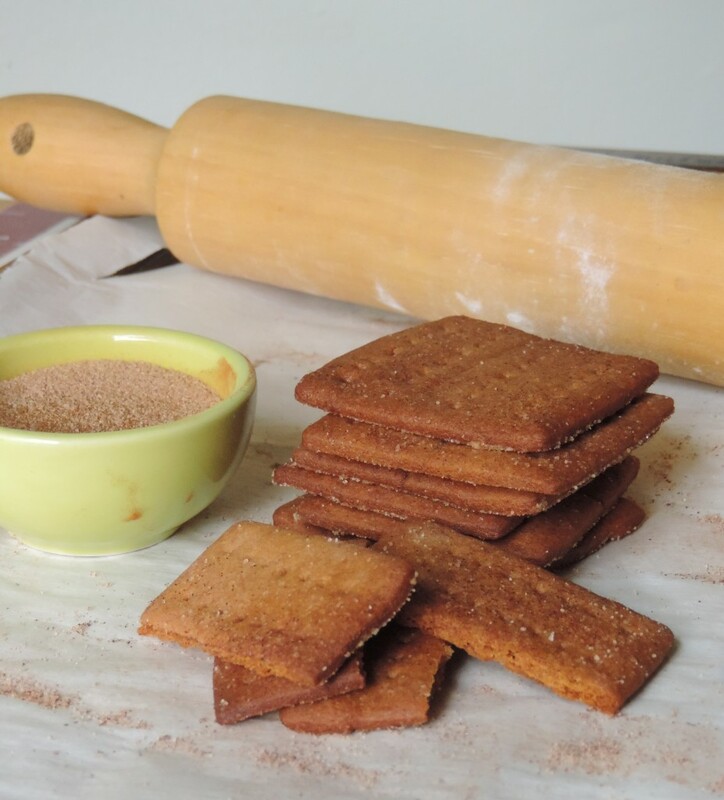 As it turns out, a lot of people use graham flour to make these crackers at home. 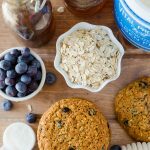 You are more than welcome to use that if you would prefer, but just know that graham flour is a type of whole wheat flour, which is why a lot of recipes will call for a mix of all-purpose and whole wheat flours (as you see here). It’s much more economical this way, too. Sweetness is added with dark brown sugar (which has a higher molasses content than light brown sugar) and honey. 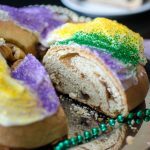 Bold sweetness is the name of the game with this recipe! You also might be wondering how in the world you’re ever going to produce a cracker texture (no? You’re just going to trust my recipe?). Believe me, I wondered the same thing! Overall, there’s not too much leavening in the recipe, and there are no eggs. Eggs will definitely add to the fluffiness of something more like a cookie, which also brings me to my favorite part: you can eat this dough without the worry you’re going to get sick from salmonella (your mom will be so happy)! It’s nice to have that option when you get to the end of your dough and have that weird amount left that isn’t enough to make another cookie but too much to feel like you might regret it later. Yeah, no problem here. Might as well nibble your way through this adventure! This dough is definitely easy to put together, but I will say, I had better luck rolling it out after I had refrigerated my second batch for 3 days. I was a little anxious to get started when I made the dough the first time, so I only let it chill for 2 hours. Yeah, that was a little tricky, so I added another hour to the refrigeration time just to be safe. That being said, if you have the option to, prep your dough with plenty of time to chill it. 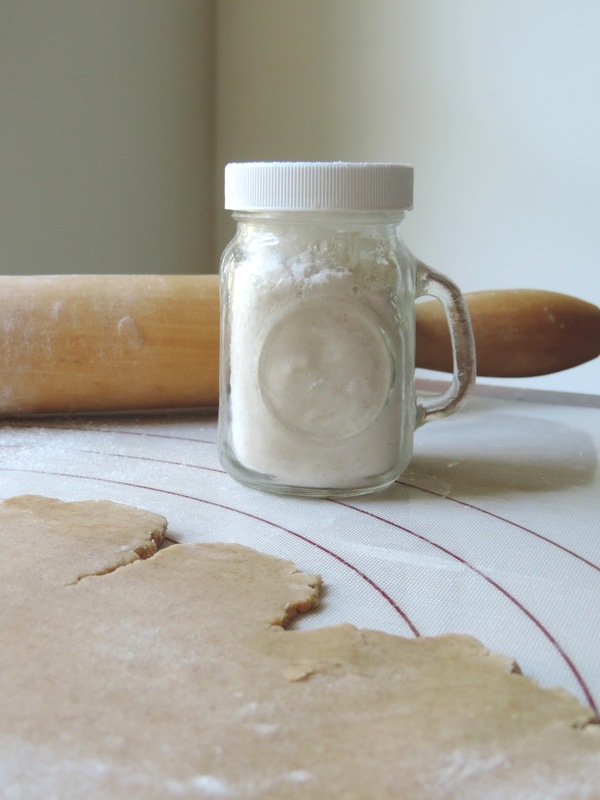 Take note that rolling and cutting dough is much easier if you have a little shaker for your flour. It makes flouring a surface so much simpler than whatever crazy way I tried to do it before I spent a whole $2 on this little guy at Target. I also wound up with far less flour in my hair and on my face. Once you’ve rolled out your dough, feel free to cut into whatever shape you desire. I have a 2″ square cookie cutter that came in pretty handy, but you can most certainly cut your crackers into whatever size you prefer. Just be sure you adjust your bake time a bit. The time I listed is for my specific cracker size. The dots I made with a fork were really just for aesthetic reasons, but let yourself get crazy with those too, if you want! 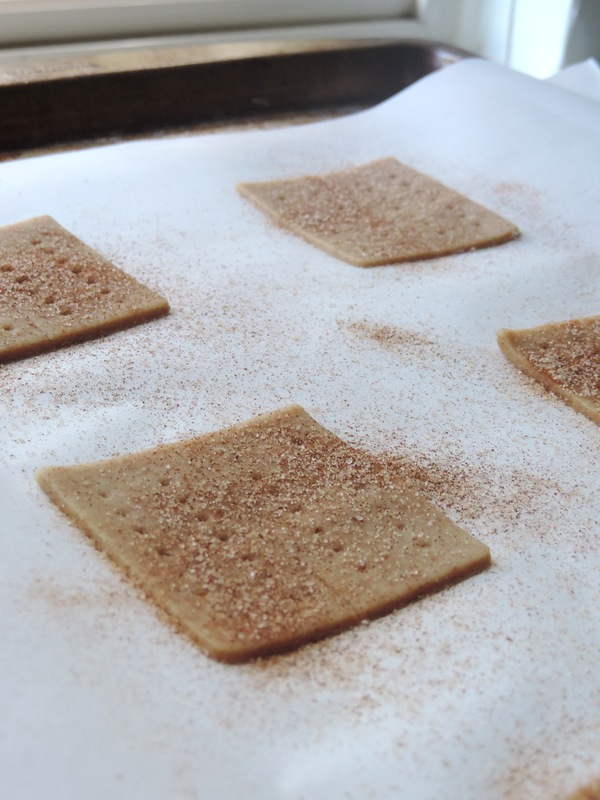 A little sprinkle of a cinnamon sugar mix and you’re on your way to graham goodness! I was a little worried about the texture as I was pulling crackers off of the baking sheet, but they really will crisp up as they cool, so just be patient. I took these into work and the consensus was pretty much the same all around: delicious! Some said they were reminiscent of ginger snaps and shortbread. As I said before, sometimes a regular treat can turn into something a little better just because it was made at home. These crackers are nice and crispy but at the same time, oh-so-buttery. That’s definitely not something you can find in a box, so that in itself is enough of a reason to try these in your own kitchen. 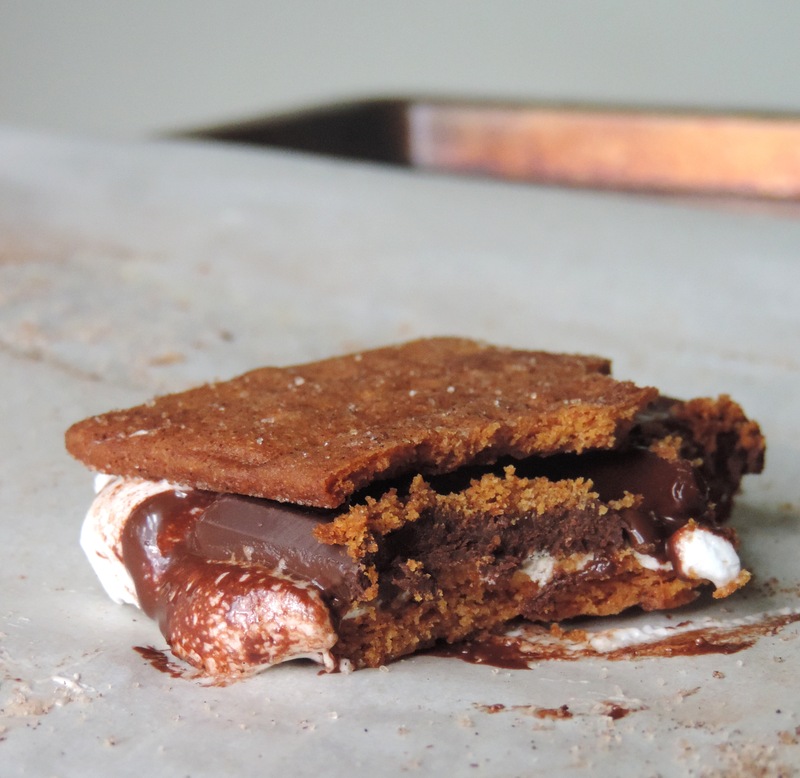 What’s your favorite way to enjoy a graham cracker? 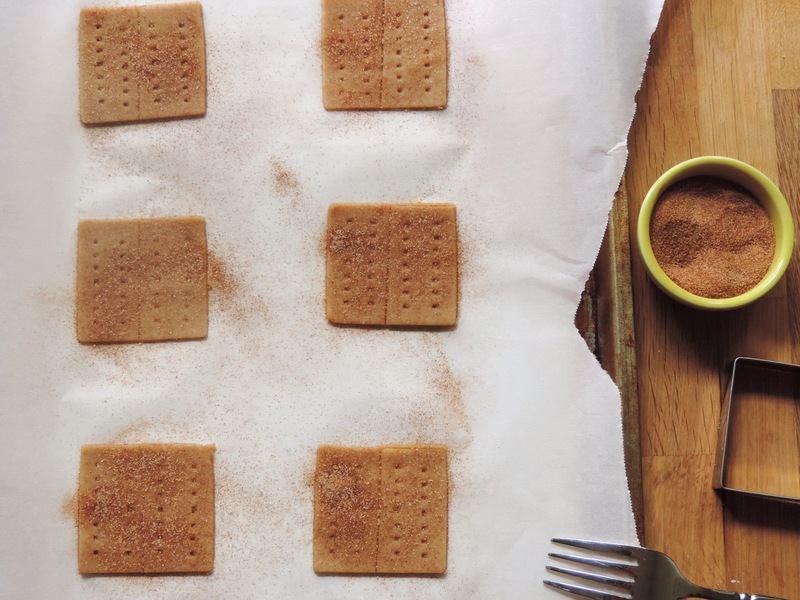 Buttery graham crackers spiced with cinnamon-- way better than anything you can get in a box! In a medium size bowl, whisk together both flours, baking soda, salt, and cinnamon. Set aside. In a large bowl with a handheld mixer or the bowl of a stand mixer fitted with the paddle attachment, combine the butter, brown sugar, and honey. Beat at medium-high speed until light and fluffy (about 2 minutes). Scrape down the sides of the bowl. Add the milk and mix on medium speed until completely combined. Scrape down the sides of the bowl again. Add the flour mixture and mix on low speed until dough is just combined. Transfer dough onto a piece of plastic wrap, press into a square about an inch thick, and wrap tightly. Refrigerate for at least 3 hours and up to 3 days. When you are ready to bake the cookies, preheat the oven to 350ºF. Line two large baking sheets with parchment paper. 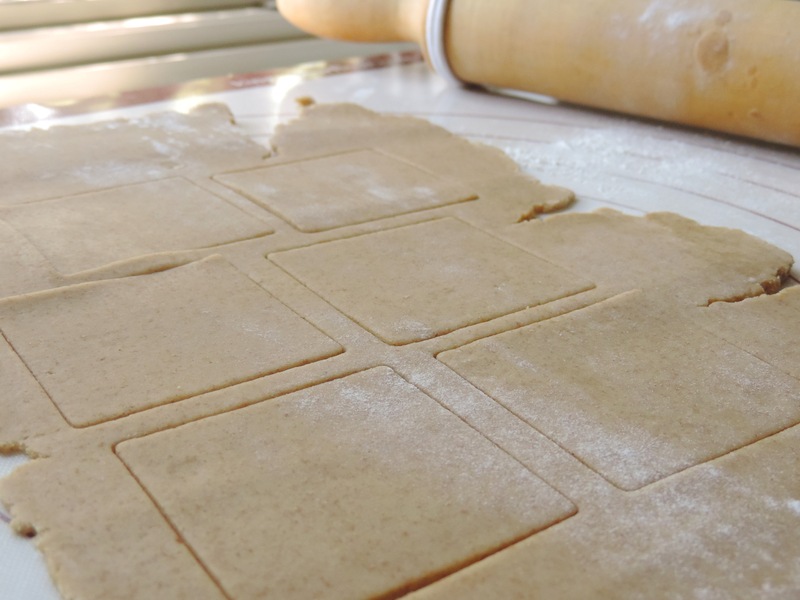 On a floured surface, roll out the dough to a 1/8″ thickness and cut into 2″ squares. Transfer to the baking sheet, being careful to space the crackers about a half inch apart. Gather scraps, re-roll, and cut more crackers. 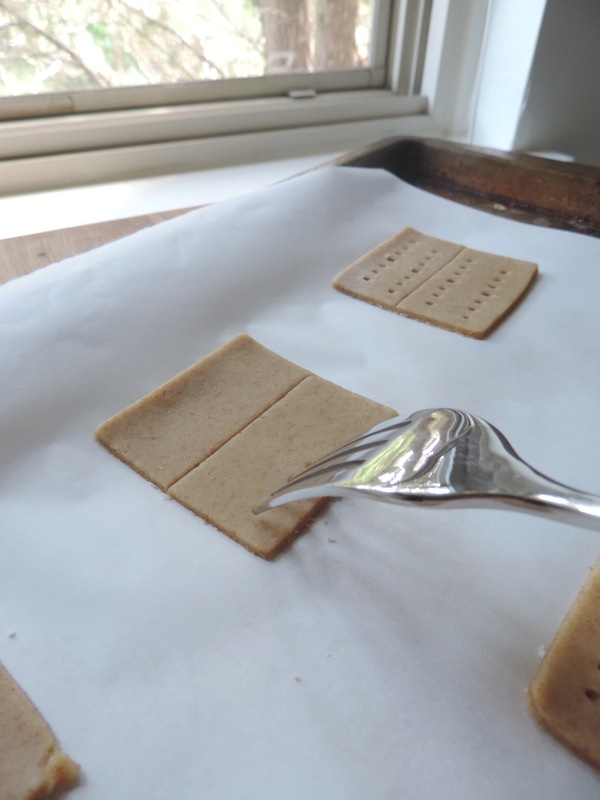 OPTIONAL: Line the middle of each cracker with a butter knife and dot each side with a fork for an “authentic” graham cracker look. 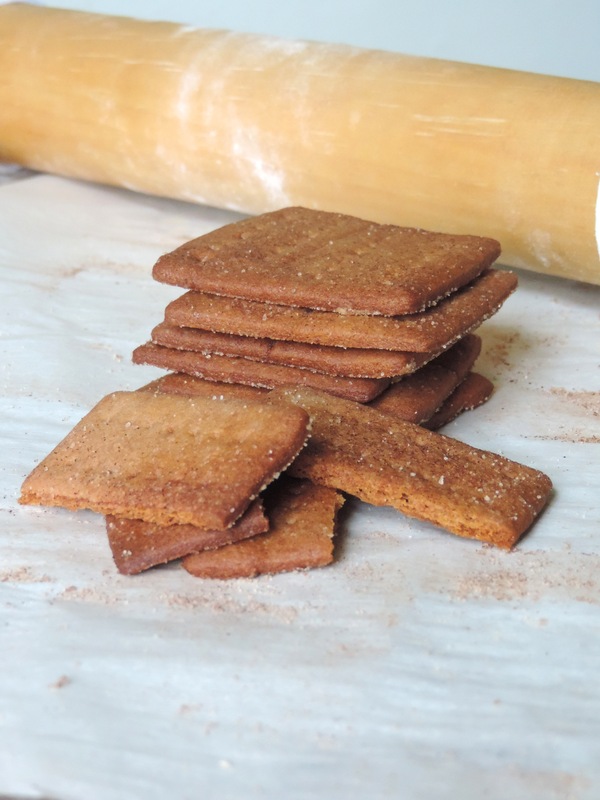 Sprinkle a mixture of 3 Tablespoons granulated sugar + 1 Tablespoon cinnamon over the crackers before they go into the oven. 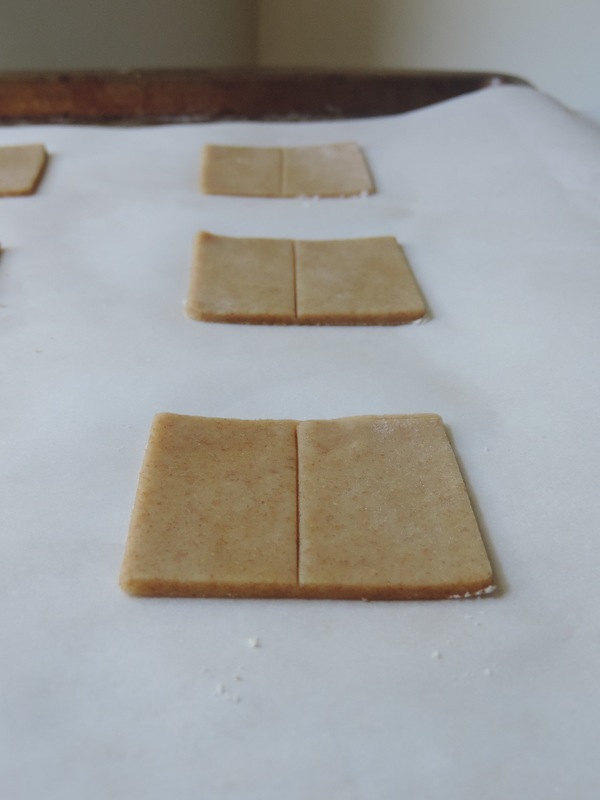 Bake crackers for 10 minutes, rotate baking sheet a quarter turn, and bake for another 2-4 minutes. 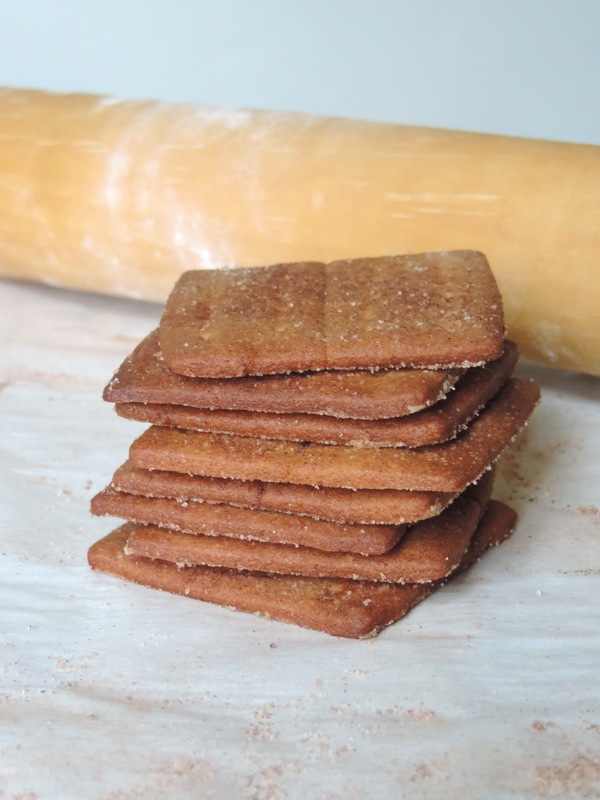 Crackers are done when they are golden brown and firm to the touch. Let crackers cool on baking sheet for a minute, then transfer to a cooling rack (they will crisp up as they cool). Let cool completely before storing in an airtight container for up to 5 days. These look amazing! I’ll definitely have to try making them.